Yellow (Melilotus officinalis) and white (M. alba) sweetclover are herbaceous, non-native legumes that are widely distributed in the United States. A native to Europe, sweetclover was introduced to North America by the mid-1600s. Spread of the plant was likely facilitated by beekeepers and agriculturalists. Sweetclover is considered both a beneficial plant and a problematic weed. 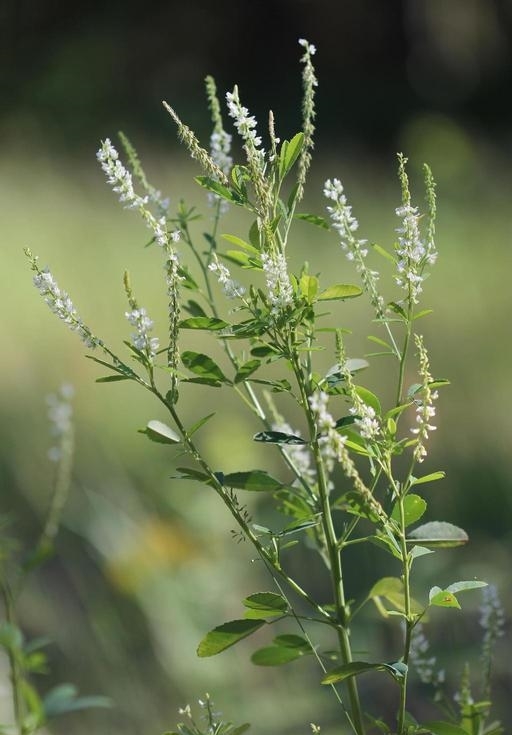 Although cultivated for wildlife and livestock forage, soil stabilization, as a nitrogen-fixer, and as a bee plant, both white and yellow sweetclover are now classified in the United States as invasive in some midwestern states and Alaska. Sweetclover is known to degrade grasslands in prairie and natural areas by overtopping and shading native plants thereby reducing diversity. The success of prairie restorations is often hindered by sweetclover invasion (Figure 1). These clovers readily occupy open habitats and have successfully exploited many native prairies and open, mesic plant communities in the Midwest (U.S.). Yellow and white sweetclover are considered biennials and rarely annuals or short-lived perennials. Plants grow vegetatively the first year, developing a deep tap-root system. During the second growing season, sweetclover stems will grow up to 6 ½ feet in height with spreading branches. Flowering takes place from April through September. Small, yellow (or white), sweetly fragrant, pea-like flowers cluster along the end of each flowering stem and in leaf axils creating slender flower heads (Figure 2). 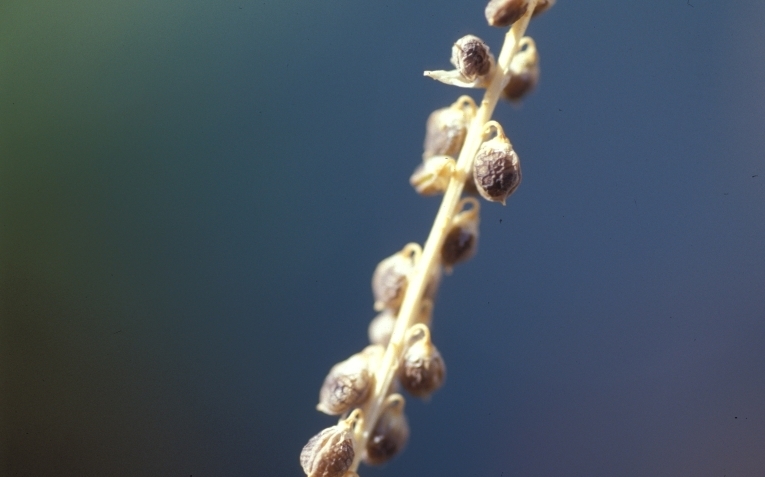 Yellow sweetclover may bloom two to four weeks earlier than white sweetclover. Each flower produces one or two small seeds with hard seed coats. Although plants die after producing seed, long-term seed viability (81 years) allows infestations to persist for years until the soil seed bank is depleted. Herbicides, physical, cultural (grazing, fire and competition), and mechanical methods have been used for managing white and yellow sweetclover. An important consideration in controlling this species is long-term viability of seeds in soil; thus management practices that stop flowering are important for seed bank depletion. Although physical, cultural, and mechanical methods can provide some control of sweetclover, this article focuses on use of selective broadleaf herbicides. Field trials were conducted in western Minnesota near Ortonville to study plant community response to various herbicide treatments in a prairie restoration. Pre- and post-treatment plant cover data were collected from 200 subplots within plots. In the plots where sweetclover was present, mean cover was about 25 percent prior to herbicide application. Results one year following application indicated that sweetclover cover declined to about 0.1 percent post-herbicide application with Milestone® specialty herbicide at 5 fluid ounces per acre (fl oz/A), equivalent to 99 percent control. On adjacent non-treated plots sweetclover cover increased to 36 percent during the same time period (Figure 3). Studies conducted by Mark Renz with the University of Wisconsin produced similar results (http://techlinenews.com/s/sweetcloverrenz.pdf). Renz reports that either Milestone at 7 fl oz/A or Grazon® P+D herbicide at 32 fl oz/A provide the most effective sweetclover control the season of treatment and one year following treatment compared to other selective broadleaf herbicides. Field trials conducted by Renz in Middleton, Wisconsin indicate that Milestone at 5 fl oz/A and Transline® specialty herbicide at 1 pint/A applied in fall provide similar control of sweetclover the spring following treatment. Winterkill of sweetclover at Middleton may have influenced control (Renz unpublished data). Sweetclover is capable of germinating throughout the growing season into fall. Herbicides applied in fall will control first year plants that haven’t flowered. However, soil residual properties of the herbicide are important to prevent seedling germination the following spring and summer. Milestone, Tordon® 22K herbicide, or Transline specialty herbicide applied in spring or early summer may control both bolting plants (second year growth) and seedlings that can germinate throughout the summer into fall. Applications made later in summer will control germinating seedlings. In prairie plantings, Milestone and Transline would provide more selective control of sweetclover than Tordon 22K. Design herbicide selection and application timing to meet management objectives for other desirable broadleaf species on the site and minimize non-target damage. Sweetclover abundance can be reduced through integrated management strategies that are designed to encourage native vegetation and limit sweetclover growth and reproduction. Integrating late spring to early fall burns, seeding desirable species, mowing and herbicides will help reduce the competitive ability of sweetclover. Gucker CL. 2009. Melilotus alba, M. officinalis. In: Fire Effects Information System, [Online]. U.S. Department of Agriculture, Forest Service, Rocky Mountain Research Station, Fire Sciences Laboratory (Producer). Available: http://www.fs.fed.us/database/feis/ [2014, May 5]. Panke B and M Renz. 2013. Management of invasive plants in Wisconsin: Sweetclovers. University of Wisconsin Cooperative Extension A3924-24. 4p. Grazon P+D and Tordon 22K herbicides are federally Restricted Use Pesticides. State restrictions on the sale and use of Transline specialty herbicide apply. Consult the label before purchase or use for full details. Always read and follow label directions.